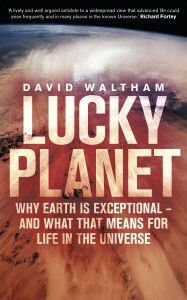 In Lucky Planet, David Waltham argues that Earth’s teeming, complex biosphere is a rare anomaly in an almost sterile cosmos. From the start, he acknowledges that many of us have strong intuitions to the contrary: isn’t Earth just another planet orbiting just another star? There are trillions of stars; most have planets, many of them in the so-called habitable zone. Why should the one planet on which we happen to find ourselves be special? The answer to this, Waltham explains, is that we find ourselves on it. Wherever intelligent observers arise, they will necessarily find conditions just right for their having arisen, even if those conditions are vanishingly rare. This “anthropic selection effect” pre-determines the kind of world we look out on, giving us the “most severe case of observational bias in the history of science”. This book shows that Earth has indeed been blessed with a highly stable and clement climate over billions of years despite regular geological and biological upheavals and the steady brightening of the sun. This is a remarkable fact; “a warming trend as small as 1 °C every 100 million years would have been enough to make our world uninhabitable by now.” The conventional explanation (“Gaia theory”) is that Earth naturally self-regulates: changes in the sun’s brightness or Earth’s albedo are automatically compensated by negative feedback mechanisms, working like a thermostat. When global temperatures increase, for example, so does the rate at which volcanic rocks are weathered, a process that pulls CO2 out of the atmosphere, diminishing the greenhouse effect and minimising the change in temperature. The result is a dynamic equilibrium. Waltham agrees that such “Gaian processes must have played a substantial role” in Earth’s history. But he points out that any planet capable of producing observers like us must turn out to have been climatically stable over the several-billion-year timescale required for our evolution, even if purely by coincidence. The anthropic selection effect negates the need to invoke a strong Gaian thermostat. It may be that oxygenic photosynthesis evolved and spread at just the right time and rate to cancel the effect of a rising solar heat flux by removing methane from the atmosphere. Likewise, a steady increase in biological weathering may have drawn down just the right amount of CO2. Earth’s long-term habitability may have been sustained by nothing more than a series of fortunate coincidences like these. Waltham draws on a wide range of evidence from geology, astronomy and climate modeling to substantiate this claim. The chapter on the Moon’s role in Earth’s habitability—based on Waltham’s own research—is particularly intriguing, and shows that far from stabilizing the Earth’s axis of rotation (as often claimed), our Moon is almost large enough to destabilize it. On the other hand, if the Moon had been much smaller (or absent), Earth could have been cooler and more prone to ice ages. It seems that we have a “Goldilocks” Moon, a coincidence neatly explained by anthropic selection. Those who claim that the Earth is special are sometimes accused of anthropocentric arrogance. One could, of course, throw the same accusation back at those who expect to find Earth-like planets throughout the universe—as Waltham points out, there are many different ways to build a planet. But the tone of this book is measured, cautious, philosophical and pleasantly light-hearted. Waltham is respectful of his scientific opponents, and even humorously self-deprecating at times. For the sake of balance, I would like to offer a few small criticisms. It is occasionally unclear whether Waltham’s anthropic arguments concern the rareness of life itself, of complex multicellular life, or of humanly intelligent observers. The long discussion of the cosmological version of the anthropic principle seems a little digressive, and the omission of any reference to the Fermi Paradox or to Nick Bostrom’s related and important work on “great filters” looks like an oversight. These are minor and somewhat academic complaints, however. Lucky Planet is a persuasive and pleasurable read.